Diamond Details: 52 round brilliant cut and 27 baguette cut white diamonds of G color, VS2 clarity, excellent cut and brilliance. Setting Details: Natalie K Platinum with halo design and antique style caviar beading. 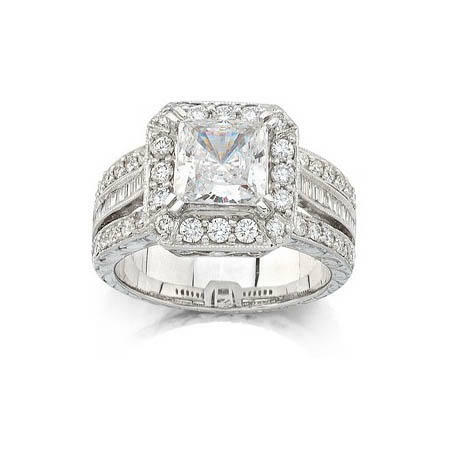 Accommodates a 2.00 carat princess cut center stone. Measurements: Natalie K rings may be ordered to any finger size. Simply allow 4-6 weeks for delivery. A 10% surcharge may be incurred for sizes 8 and over. Natalie K sculpted this magnificent antique style platinum halo engagement ring setting, setting it alight with 52 round brilliant cut and 27 baguette cut white diamonds of G color, VS2 clarity, excellent cut and brilliance. Caviar beading tastefully engenders a discrete antique style. Accommodates a 2.00 carat princess cut center stone. Natalie K rings may be ordered to any finger size. Simply allow 4-6 weeks for delivery. A 10% surcharge may be incurred for sizes 8 and over. We carry an extensive selection of separately sold G.I.A. certified diamonds to nestle onto the center of your beckoning setting. View our inventory of G.I.A. and E.G.L. loose certified diamonds. Please contact us for pricing: 1-800-790-6980, 1-212-302-2863, or info@firenzejewels.com.